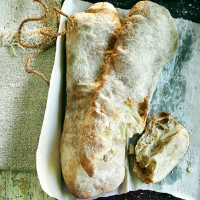 Meaning ‘slipper’ due to its long, crumpled shape, ciabatta is a surprisingly modern loaf, invented in 1982 by baker Arnaldo Cavallari, to challenge the popularity of the baguette. Like the focaccia, the dough is very wet, which creates that classic open, ‘hole-y’ texture. Don’t be afraid to use plenty of oil when kneading. 1. Prepare the biga the night before. In a deep bowl, beat together the flours and yeast with 160ml warm water, until combined. Scrape down the sides, cover and leave at room temperature for at least 8 hours, or ideally 12-16 hours. 2. The next day, gradually incorporate the flours, salt and yeast into the biga with 265ml warm water, until you have a smooth, wet dough. Transfer to a well-oiled work surface and, with oiled hands, knead vigorously for 20 seconds, then rest for 10 minutes; repeat twice, using more oil as needed. Put the dough in a large oiled bowl, cover and leave to prove at room temperature for 1 hour. 3. Scoop the dough onto an oiled work surface, flatten it slightly, then fold all 4 sides into the centre. Return to the oiled bowl, seam-side down, to prove for another hour, then repeat the folding and proving process again. 4. Now shape the dough, trying to handle it as little as possible to keep in the air. Flour a clean work surface very generously and scoop the dough on top. Flour the top of the dough and, using a floured knife, cut it lengthways into 2 even pieces; dust off the excess flour from the surface of the dough. One loaf at a time, fold the long sides into the centre, overlapping them slightly. Carefully transfer the loaves, seam-side down, to a large, well-floured baking tray. Cover with a clean tea towel and prove until puffed up – about 45-55 minutes. 5. Preheat the oven to 250˚C, gas mark 9, and put a deep, clean metal baking dish on the bottom of the oven. When ready to bake, put the bread on the middle shelf and fill the bottom dish with just-boiling water. Immediately reduce the temperature to 200˚C, gas mark 6, and bake for about 25-30 minutes, until the bread is golden and hollow-sounding when the base is tapped (if it browns too quickly, reduce to 180˚C, gas mark 4). Cool completely on a wire rack before serving.